Cooling of a steering wheel injection mold: Non-isothermal pipe flow is fully coupled to the heat transfer simulation of the mold and polyurethane part. The Pipe Flow Module is used for simulations of fluid flow, heat and mass transfer, hydraulic transients, and acoustics in pipe and channel networks. It can be easily integrated with any of the other modules in the COMSOL® Product Suite for modeling the effects piping has on larger entities, such as cooling pipes in engine blocks or feeding and product channels connected to vessels. This allows for the conservation of computational resources in your overall modeling of processes that consist of piping networks, while still allowing you to consider a full description of your process variables within these networks. Pipe flow simulations provide the velocity, pressure, material concentrations, and temperature distributions along pipes and channels, while it can also simulate acoustic wave propagation and the water hammer effect. The Pipe Flow Module is suitable for modeling incompressible flow in pipes and channels whose lengths are large enough that flow can be considered fully developed. With this assumption it uses edge elements, solving for the tangential cross-section averaged velocity along the edges, to avoid meshing the cross section of the pipe with a full 3D mesh. This means that the modeled variables are averaged in the pipe's cross sections and vary only along the length of the pipe. Built-in expressions for Darcy friction factors cover the entire flow regime including laminar and turbulent flow, Newtonian and non-Newtonian fluids, different cross-sectional shapes or geometries, and a wide range of relative surface roughness values. These can be varied according to their position in the network, or directly related to the variables you are modeling. Friction is not the only contribution to pressure loss in pipe networks. The Pipe Flow Module also considers the effects of bends, contractions, expansions, T-junctions, and valves that are computed through an extensive library of industry standard loss coefficients, while pumps are also available as flow-inducing devices. As with any physics interface in the COMSOL Product Suite, you can freely manipulate the underlying equations, add your own source or sink terms, and express physical property as functions of any model variable. COMSOL Multiphysics® also allows you to bring in data to describe a certain material property or process parameter, as well as subroutines written in MATLAB®. A heating system involves fluid circulating in a pond. Modeled is the temperature profile in the system as well as the pressure drop. Pipe acoustics are coupled to a 3D pressure acoustics model in a probe tube microphone. Pressure transients in a pipe after suddenly closing a valve that instigated the water hammer effect. 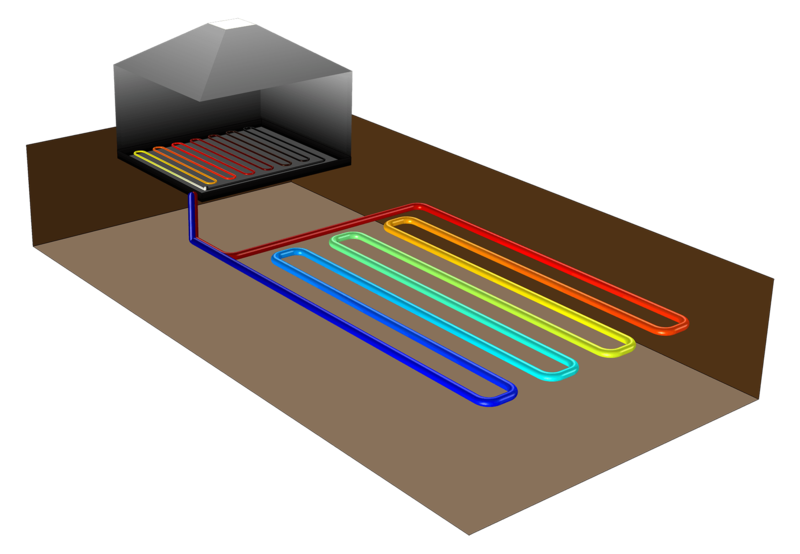 Ground heat recovery is an energy efficient method to supply houses with heat, where heat collectors exist in a subsurface environment. This model compares different patterns embedded in the subsurface with typical thermal properties of an uppermost soil layer in a garden. Underfloor heating and cooling is a form of central heating and cooling which achieves indoor climate control for thermal comfort using conduction, radiation and convection. It delivers more uniform heating to a room than convector fans or wall radiators would. This app simulates the balance between temperature requirements and pressure drop (running costs) together with construction and material costs (fixed costs) for different floor materials and and dimensions. The physics in the Pipe Flow Module describe the conservation of momentum, energy, and mass in the fluids inside a pipe or channel system. These systems can easily be coupled to other systems that cannot be described using the approximative methods in the Pipe Flow Module, but require a full description of the system's physics in 2D or 3D. The Pipe Flow Module allows the mapping of data from edges, to surfaces, and to volumes, and vice versa. This means that the flow or heat transfer in a pipe network can be coupled to that occurring in, for example, a fully-meshed 3D vessel, and solved simultaneously. Furthermore, as with all physics-based products in the COMSOL Product Suite, this coupling can occur between different physics formulations, so that a property like thermal stress can be just as easily solved, for example thermal stresses in an engine block equipped with cooling channels. 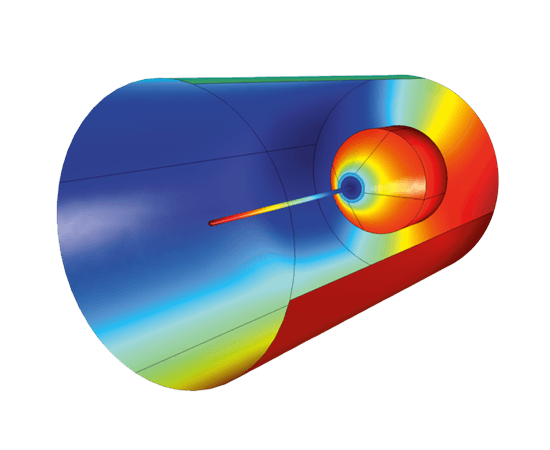 The Pipe Flow Module features specific tailor-made physics interfaces for modeling heat and mass transfer and chemical reactions. The pipe network can be embedded in, for example, a 3D solid domain. 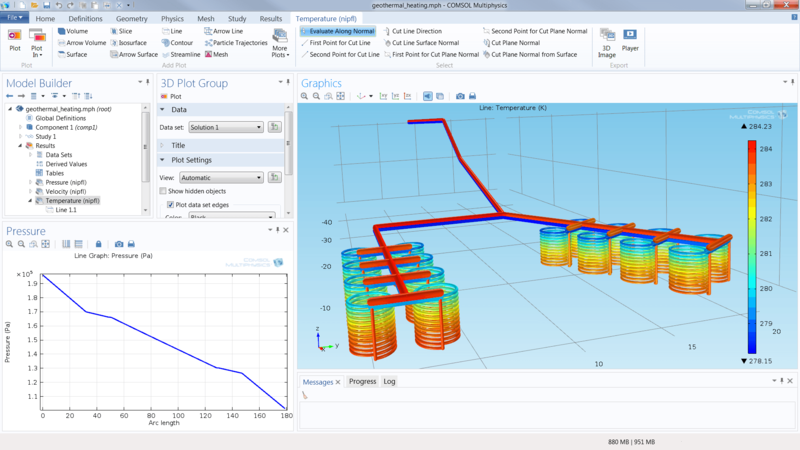 In the case of heat transfer, the module computes the energy balance in your pipe systems including the contributions from the interaction with the 3D domain, which are expressed as sources or sinks in the pipe equations. 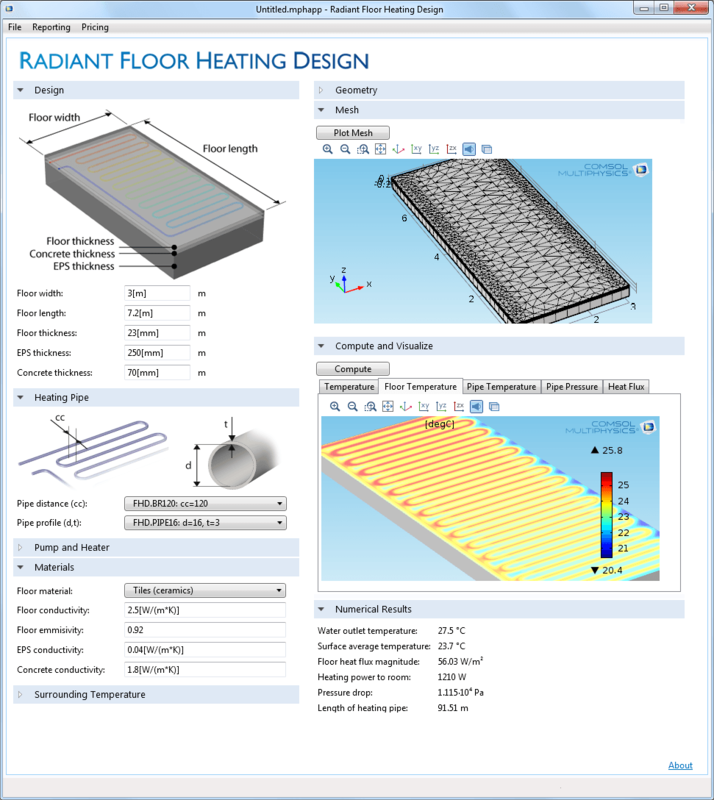 This is automatically done under the hood by activating the interaction with 2D or 3D solid material in the graphical user interface (GUI), where you can also select from the available correlations for forced and natural convection to the surrounding environment, pipe materials, and pipe wall thicknesses that are included with the Pipe Flow Module. The material transport-based physics interfaces solve a mass balance within the pipe system and, while being coupled to the description of the pipe flow, also consider diffusion, convection, dispersion, and chemical reactions. The Pipe Flow Module models compressible flow brought about by rapid hydraulic transients, through taking the elastic properties of both the fluid and high wall into account. These effects can occur through the rapid closing of the valve, and are known as the water hammer effect. The propagation of acoustic waves along flexible pipes is also a contributing factor to the design, planning, and building of these networks. When combined with the Acoustics Module, the Pipe Flow Module is able to perform acoustics analyses in both the frequency and time domains. Once again, the physics that are solved for in the Pipe Flow Module can be seamlessly coupled to any other physics within the pipe network, and any physics in the system surrounding the network. The Pipe Flow Module is appropriate for modeling all types of pipe and channel networks where flow, mass and heat transfer, and acoustic waves travel. This includes the piping systems of chemical and process industry plants, power stations, refineries, petroleum and water in pipelines, ventilation systems, and cooling systems in engines and turbines. Furthermore, it is a great addition to the modeling that you perform using COMSOL Multiphysics and its suite of add-on products. This includes optimizing intricate and integrated cooling systems in turbines, molds, casts and heat exchangers, planning ventilation systems in buildings, and designing geothermal heating systems. * Requires the Acoustics Module. INJECTION MOLDING: Cooling of a steering wheel injection mold, including pipe flow and heat transfer in cooling channels. The 1D cooling channels are fully coupled to the heat transfer simulation of the 3D mold and the polyurethane part, on an imported CAD geometry. The Cooling of an Injection Mold model presented in the video can be downloaded from our Model Gallery. 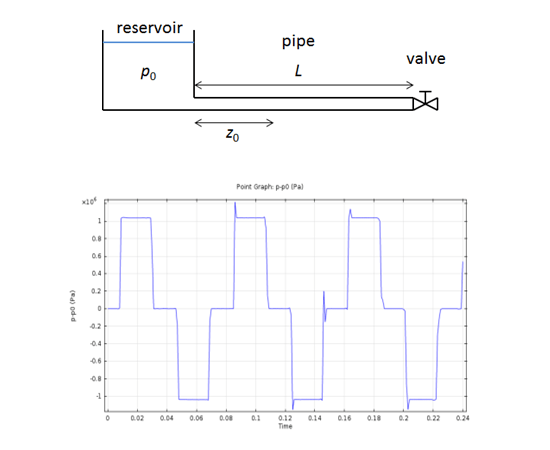 This tutorial model illustrates how to calculate the pressure drop and initial flow rate in a pipe system connected to water tank. The Pipe Flow interface contains ready to use friction models accounting for the surface roughness of pipes as well as pressure losses in bends and valves. This model shows how you can use the Non-Isothermal Pipe Flow interface together with the Heat Transfer in Solids interface to model the cooling of a injection molded polyurethane part for a car steering wheel. The equations describing the cooling channels are fully coupled to the heat transfer equations of the mold and the polyurethane part.